The December issue of Portland Monthly featured 50 Things every Portlander Must Do This Winter with a special guide on Northwest Wandering. We were excited to see that one of our contributors, Jackie Arnal, had her photo featured in the article! We were so excited that we wanted to help you get closer to those adventures by providing links to detailed trip reports and maps for each of the locations mentioned. If you're looking for a relaxing alpine escape, head to the Mount Hood Wilderness for a day or weekend of winter fun. With over 63,000 acres of forest, rivers, trails and mountains there is plenty of room to play regardless of your mode of transportation: sled, snowshoes, skis, or good old fashion boots. At Teacup Lake there are 12 miles of groomed trails that range from easy to difficult, and all are designed for skate and classic cross-country skiing. Not far from Teacup Lake are the 2-mile Mount Hood Meadows Eastside and the 4.9-mile Trillium Lake loops, both offering groomed trails and views of the mountain. Their parking areas can fill quickly on weekend mornings; we recommend starting early to beat the crowd. White River West Sno-Park is a popular sledding, snowshoeing, cross-country skiing and skinning area. Beautiful views of Mount Hood lure you up the gradual incline and away from the crowds near the parking lot. 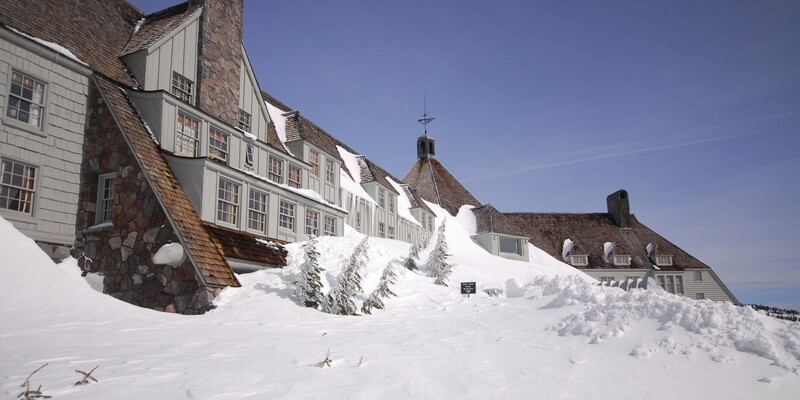 Whether you're planning to stay the night or simply sip on a winter warmer, a stop at Timberline Lodge is recommended. The drive up to the lodge, and it's huge stone fireplace and beautiful woodwork, make this one of Oregon's most visited attractions. For a more rugged adventure, spend the night in a fire lookout or one of the three Cascade Huts. In the winter months all of these huts are a good ski or snowshoe in, but cozy wood stoves and amazing views are a great reward at the end of your journey. Rustic accommodations in the Mount Hood area include Clear Lake Butte Lookout, Fivemile Butte Lookout, Flag Point Lookout, the Cascade Huts, Barlow Butte, Barlow Ridge and White River. You can reserve any of them for one night or multiple nights, or even string together different huts for a longer trip. We hope this guide helps you find your adventure on Mount Hood this winter. Have fun, and don't forget the hot chocolate!